The Shelter Island Public Library Tennis Tournament returns on Saturday, August 18. PETER BOODY PHOTO | The first-ever Shelter Island girls tennis team. 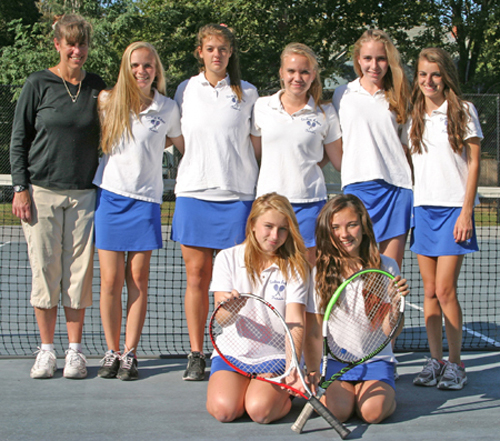 As stated in the Reporter two weeks ago, Shelter Island High had its first varsity girls tennis team this year. This left me with 11 players. Two of them are 7th graders, Madi Hallman and Caitlin Binder; and one 8th grader, Evi Saunders. These three girls had to pass running, agility and strength tests to play on the varsity level. Also returning were 9th grader Serina Kaasik; 10th grader Nicole Poleshuk; 11th graders Brianna Kimmelmann, Jenny Case and Taylor Sherman; and seniors Lisa Kaasik, Jill Calabro and Corrine Mahoney. I knew we were going to have a tough year with the loss of the two players and playing on the varsity level. Our team leader and captain, Lisa Kaasik, had a good year at first singles with a 6-6 record. Freshman Serina Kaasik, who played fourth singles last year, played second singles this year. She had a terrific win against Eastport/South Manor, who as a team was undefeated and won our league. Playing third singles was Corrine. (She played first doubles last year.) So playing singles was a new game for her. She always seemed to get a really tough player. She had the closest match of anyone and did a great job of holding her own. The fourth singles spot was shared by 7th graders Madi and Caitlin. They played much older and more experienced players but did a great job. First doubles was Nicole and Evi. Often they faced a first- or second-singles player playing doubles, which made their job even harder. A team’s two best players usually play singles. Second doubles was Jenny and Brianna. Their best match of the year was a three-set win against Southampton. Third doubles was Jill and Taylor. They did a great job with wins against Southampton, Center Moriches and Southold. Although the team didn’t have any varsity wins, we were close, losing four of our matches by only one point. It was a good experience for the girls to face more advanced players. Hopefully, they will set new goals for next year. For example: learning to hit with topspin, moving their feet to get set up for the ball and directing their shots. We had two players who earned All-League honors this year, Lisa and Serina Kaasik. They also got to play in the conference tournament at William Floyd High School. Serina, unfortunately, had to play the number-three seed of the tournament in the first round and lost 6-0, 6-0. Lisa made it to the second round, where she had to play the eighth-seed Carly Grossman of East Hampton. She didn’t win but gave her a tough 6-3, 6-2 match. Congratulations to both of them. As a coach, it was hard not winning a match. But I must say that of the six years coaching tennis at Shelter Island, this was my favorite year. I had a great bunch of girls whose ages and skill levels varied greatly but they all seemed to get along well. It was nice to watch all of them improve against the higher level of competition. I hope they all continue to play tennis. I also want to say a special thanks to Lisa and Jill. The two or them have played on the tennis team for all six years. Thank you and I’m going to miss you next year. Come visit and bring your racquet.